April 28, 2016. Last night again rain, and with this round some fierce winds. By dawn, clear sky (the better to assess damages). Chainsaws buzzing all day – removing fallen and torn-left-hanging branches – kept me stirred up. I can’t recall my dreams, but I woke with Ray Wylie Hubbard singing about true believers out on the road tonight (from his song The Messenger) and instantly thought of the baby wrens nested near our front door. I am awed by the unwavering trust birds have that another and then another tasty insect is ready for the snatching and taking back to hungry young. Too busy to worry! They must also trust storms will cease. I found the wren house intact, a chorus coming from within. Assorted yard objects at peculiar angles amplified my gratitude for a sturdy bird house securely hung in an optimal location. As often happens, gratitude leads me to my camera. I got lucky catching both wren parents in a single shot – but their motion made matters a bit blurry. I experimented with artistic processing tricks and ended up with this soft reflection of their energy. April 14, 2016. 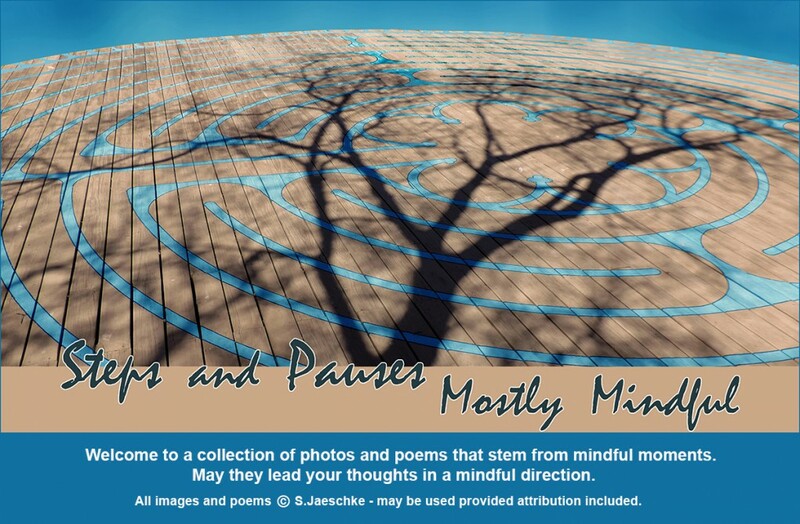 In a recent workshop with John Fox (Mr. Poetic Medicine) and Mirabai Starr (Mystic), we practiced the poetic therapy of reading a poem several times and then writing a personal response – a new poem perhaps tied to the one read, and perhaps off on some diverse tangent. In other settings, I am practiced in reading poetry ala Lectio Divina – three times (for phrases that resonate; then for feelings engendered; finally for meaning to the listener). Mirabai shared her father’s emphasis on reading poems three times which struck me as a beautiful description of Lectio: First reading, you are knocking on the poem’s door. Second reading, you open that door. Third reading, you enter the room of the poem. A few days after that workshop, I sat with a friend and David Wagoner’s poem “Getting There”. We read it to one another – knocking, opening, entering – and then wrote. This poem emerged, stemming from Wagoner’s reference to cheek against sandstone – which took me back to Lake Powell on the Arizona/Utah border. Tall red sandstone cliffs rise from bright blue water under blue skies. Tour boats take you past row upon row of what look like ancient women in robes, shoulder-to-shoulder. I’ve been there twice, and both times had the sense of being called to by cliff voices. This image is from 2007. April 12, 2016. This post is a tribute to Story Circle Network and its founder Susan Wittig Albert – for the force motivating me (and so many others!) to put into writing the stories running through our lives, our hopes. I found Story Circle in 2000 when I was still getting my feet wet writing poetry. At my first Story Circle workshop, prompted to write about something important to me, I spurted out the story of the rocking chair that helped me transition from home to college. I was hesitant to read aloud, but that seemed to be expected, and so I read. Susan Albert’s exclamation “You’re a writer!” went right to my heart.